Information Published in the USA by Electronic Arts. 7.50 points at 16 votes (rank 207). Wild shooting in appropriate surrounding. 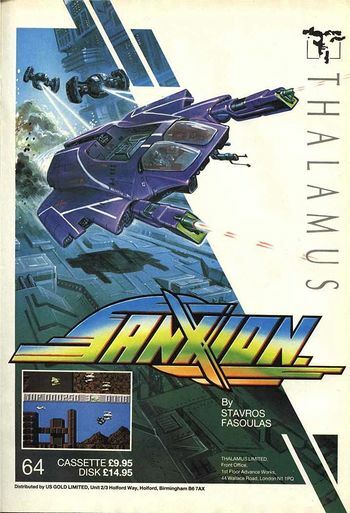 With the horizontally scrolling shooter Sanxion the software house Thalamus delivered their first work for the C64 and ZX Spectrum in 1986. 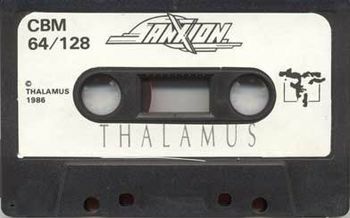 Together with Delta and Armalyte Sanxion forms a loosely connected trilogy around the "Project Damocles" and the fight against the H'siffian-Khanat. As the rather extensive background story for a shooter game wants to make us believe, the world was brought to the border of an atom war by subtile manipulation of an intergalactic alien imperium. Only through the fortunate circumstance, that the alien technician stationed at the north pole pressed the wrong button when sending the success message and made for a planet-wide blackout by a massive electronic impulse, this threat was called to attention. East and west send their pointy-heads into the Arctic as fast as possible, where they find the remains of the crashed UFO and after a short inspection come to a horrible conclusion: the beer is empty! No, rubbish: Humanity is seen by aliens as a threat, which needs to be wiped out, before it conquers space and can become a danger. As the invasion fleet is already on its way, they delay the nuclear holocaust to later and agree, that the most modern technology of both superpowers and the remains of the UFO are united in one project named "Damocles". The aim of the project is to provide spaceships and pilots, with which ten sectors need to be passed and all infiltration efforts of the aliens have to be warded off. 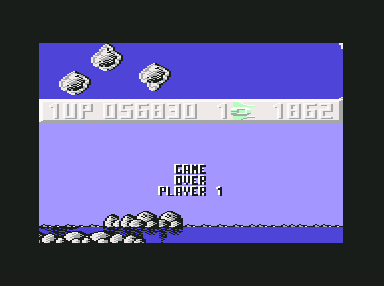 The game comes with a clean parallax scrolling and in each sector different backgrounds, e.g. desert, industrial areas or snow covered woods. The enemy sprites are animated flickering-free but designed rather simply. 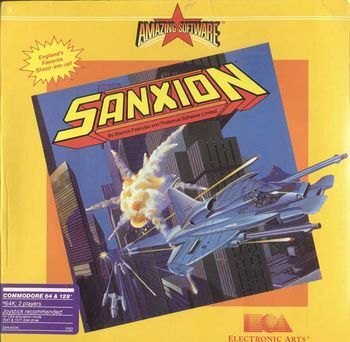 The metallic-look already known from games such as Paradroid and Uridium also finds itself in many graphics in Sanxion. It is noticable that the gravity was included into the controls of the own spaceship, which would sink without countersteering. 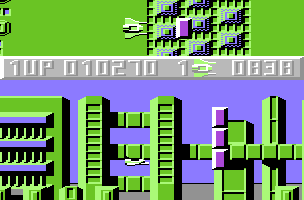 A speciality is the split-up of the screen into two areas: a side-view as you are used to from horizontal shooters and where the actual action takes played and above that a kind of radar, which shows the happening from the top view. 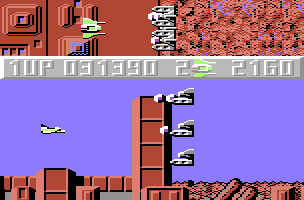 Here, approaching alien formations can be seen a few seconds earlier before they arrive at the actual game area. As this radar display takes up 33% of the screen, the main game field seems rather small and offers little space to manoeuvre. in the starting screen an SID interpretation by Sergej Prokofjews "Dance of the Knights" (Video at YouTube ) from the ballet "Romeo and Juliet", a piece which also in the 8bit conversion sounds like dramatic grandiloquence. The sound effects are for a shooter fitting and typically spacy, the crescending and descrescending buzz of the drive is omnipresent and is accompanied by the shooting and explosion noises. Multicoloured attack formations were the dernier cri in 1986. Already at that time very obnoxious: barriers whose position you need to know by heart. O.k., what buffon was that who pressed the LSD button? bonus points for the time left at the end of the level: time left ×10. If all ten levels have been played through (haha! ), the game goes on in the "Darkside": all levels are now darkened and there are additional obstacles. Full speed and permanent fire: always a good combination. Fire button: Trigger energy impulse on the primary weapon of the spaceship in order to dematerialize the attacker, commonly: shooting. 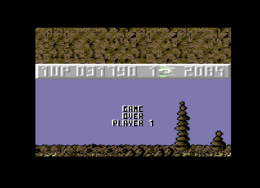 In the title screen: start of the game. Joystick in all directions + fire: steer ship AND shoot at the same time. Joystick right: at the right border of the screen: speed up! 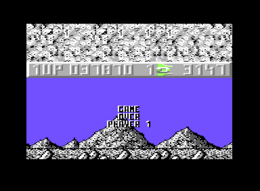 After reaching the town hold the glider at the upper border and after passing the first barrier pull down instantly. Then, after flying under the second barrier pull up again. After flying over the third barrier just let go of the joystick. Gravitation should get you directly through the gap of the fourth barrier. The version by Lucid and Tricycle has both trainer options and a subsequently built-in highscore saver and is therefore the first choice. Robotron2084: "Clean scrolling and good sound meet sedate controls, and due to the limited game area also oversized sprites. The introduction of the radar display can easily be seen as a crazy idea, because you do not have much use of it during the game - in the contrary, due to the wasted space you have too little space to manoeuvre and constantly bang against something. The fun of the game also suffers further setbacks by a much too high number of indestructible enemies or obstacles, of which many also come speeding out of the left field - preferrably from behind - so that even with the "great" radar you have only a fraction of seconds time to be able the react, which of course then fails. Even more than with its successor Delta you have to quasi learn every level by heart - only to rely on your reaction does simply not work. 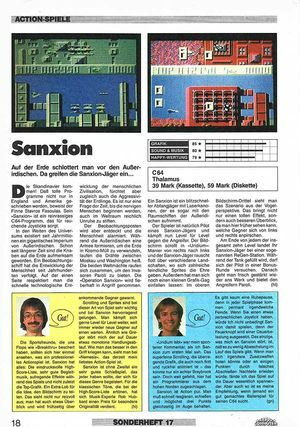 Very regrettable, as seen from the technical side, Sanxion is really well-done for 1986, but unfortunately the many unfair situations leave a bad taste in one's mouth. The high evalutaions that the game received at that time in almost all computer game magazines, I cannot comprehend. For me it is only a laboriously played mirror finish shooter that forgives not a single mistake. 6 out of 10 points." 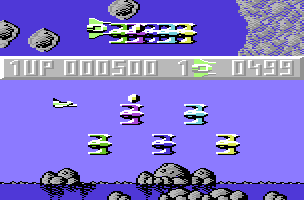 The game was awarded the British Golden Joystick Award in the category Best Soundtrack of the Year in 1986. High resolution in loud pink...also "nice"...ugh! Absolute overview by the use of fullyfour(!) different colours. 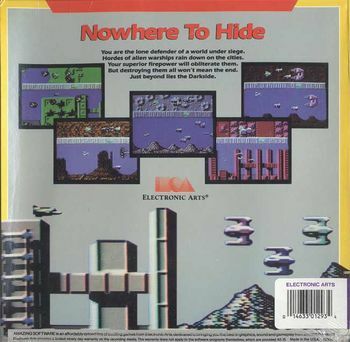 Front side of the US disk version sold by Electronic Arts. This page was last modified on 20 July 2017, at 12:47.